Playgrounds aren’t just for kids anymore. New designs cater to older adults who want to increase their flexibility and balance—as well as have fun. Playgrounds for older adults are starting to mushroom in cities nationwide, including Miami, Kansas City, Los Angeles and New York City, according to Next Avenue. 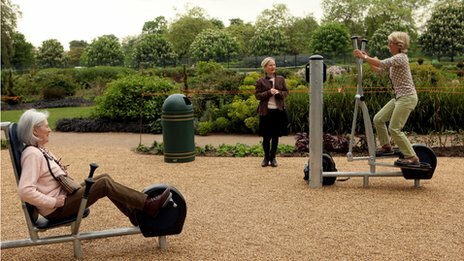 The latest fitness trend, popular in Europe, features low-impact exercise equipment designed to promote flexibility, balance, speed and coordination. Adult playgrounds expose us to a new experience, and challenging older brains in such a way can help fight dementia. Plus, playgrounds are fun and provide a chance to interact (play) with others, including children who may have a nearby playground of their own. Just take it slow on the slide. "A Fun, New Exercise Trend for People Over 50,” April 4, 2016, Next Avenue.